Does Your German Shepherd Dog Eat Poop? 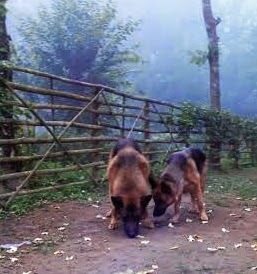 Training German Shepherds seems to be comparatively easier than some of the stubborn breeds like Shiba Inu, Chow Chow, Pekingese, Borzoi etc. Yet wrong techniques can make easiest things tougher. Even with the most intelligent breed like GSD, training may be incredibly challenging if not proceeded correctly. However, abusive training methods are a big ‘NO’, and ‘NO’ for ever, and ‘NO’ for any and all animals – irrespective of breed, group, class and species. Importance of reward based training finds its role to play here. What does a reward have to do with training? Let’s start off with asking ourselves: “why should we need to train a dog at all?” Well the answer is simple… we train our dogs because we want them to behave the way we want, which means we want to modify their behavior to suit best the way we live and mingle in the society. Rewards can really do the trick. For dogs, the punishment (traditional and primitive way of teaching tricks for example leash jerks, shock from the collars, hitting, and using prong choke chains) works just temporarily and on a surface level. Training based on rewards like lavish praises, treats etc. is a better, safer and smarter alternative that gives desired outcome more effectively. The reward-based dog training (positive training) methods has drastically won over the traditional discipline-based training methods. Most contemporary canine behaviorists and trainers are relying on the effectiveness of treat reward training systems. Reward based training system emphasizes on praising and rewarding on correct actions of your dog, rather than not rewarding and accompanied with punishments based corrective measures when your dogs behaves incorrectly. Years of experimentation and study of canine psychology concluded that “not rewarding and accompanied with punishments based corrective measures when your dogs behaves incorrectly” works less effectively compared to “praising and rewarding on each and every correct action of your dog”. What the reward based dog trainers stress on? Most modern reward based trainers believe in eliminating the undesirable behavior by gradually replacing them with desirable ones. And that can be done by rewarding your dog when he does what you want and refusing praising or rewarding him when he does what you don’t want. The new behavior that is the one that you want him to act like is called “incompatible behavior” (good behavior - not compatible to the current situation, and needs to make them compatible), which can be eventually induced through Positive Reinforcement – rewarding. Food like cookie tidbits yield awesome results in a Reinforcement Training. However, with wrong identification of the specific behavior to target, the reinforcement training may backfire. To conclude with I should be pointing that the most important thing about reward based, positive reinforcement training is “Attention”. Attention is the best reward for your dog when he does something good and another important thing is that training should be a fun for both your and your dog. Proper exercise in the form of play is the best source of stimulation to ensure physical and mental well-being. Just came across CollarsAndTags.co.uk-kong-dog-toys an online shop for pet toys offering a good assortment of fun and indestructible dog toys. A content dog (the one that usually adequate exercise and play) is mentally more stable and more focused which make him a better student for any experienced trainer. One of the most challenging situations for you as a dog owner is when your dog have grown a tendency to eat poop and you need to stop him doing so. The first step to dealing with this problem is to spot out what makes your dog find poop edible. Apparently eating poop may not cause any instant damage to the health, but the habit is one of the most unpleasant behavioral flaw that hinders the healthy environment when it comes to staying with dogs. However, this habit of eating poops, called 'Coprophagia' may expose your German Shepherd to the risk of getting heavily infested by parasite, and viral or bacterial attack. 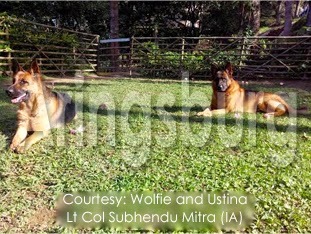 Image Courtesy: Wolfie & Ustina - Mr. S. Mitra, Lt Col, IA. Several studies have come up with a few conclusions as to why dog may be growing tendency to eat stool. While some of the reasons are simply quite natural based on certain situations, the others are driven by really complicated psychological factors. Mother cleans her puppies (Natural Maternal Instinct): Mothers tend to lick up her pups after they are done with their meal. This is a natural process to defecate puppies and to stimulate urination. Most often mothers also lick up their babies stool and urine as a cleaning process. Dogs living with us at home should be kept under supervision and the owners needs to be a bit more proactive with the cleaning process until the puppies grow and separated from their mother. Frustration elicited habit: Poop-eating habit has been connected to certain psychological conditions by some canine behaviorist. Studies aver shown that bored, frustrated, unattended and lonely dogs usually develop certain undesirable behavioral problems - and 'Coprophagia' (habit of eating stool) is one of them. German Sheperds are working dog and always need something to do until their energy is fully exhausted through proper exercise. Hence they get bored more easily compared to many other breeds if they are left unattended and without right exercise. Loneliness and boredom generate mental stress in your dog. Just like many of us are found biting nails under stress, your shepherds may develop 'Coprophagic' tendency as a frustrated elicited behavior, often times leading to Obsessive Compulsive Disorder. In case it has developed into OCD (Obsessive Compulsive Disorder) medicine doesn’t really work. It is then recommended to provide your GSD with an optimized environmental enrichment – play fetch, chasing Frisbee, long walk (composed of both brisk walk and stroll). Some nutritionists think that food type contributes to this habit to a fairly good extent. The food that you give to your shepherds may have nutrient deficiency. Same food may work good with other dog, which means your shepherd require certain thing in extra. This is yet another challenge to find out what is that thing that your dog is not getting adequately. It may not be the case that your dog is not getting adequate nutrient, but some nutritionists believe that malabsorption of dietary nutrients in your dogs may also lead to Coprophagia. Many dogs are keen to ingest stool of other animals and investigate garbage bin to find what have to eat. Often times, odor of poops and garbage acts as an enticing attribute for you dog and waste parts, like stools and stale garbage may not be unpleasant to dogs unlike they are for us, humans. Many a times I have found many dogs getting attracted to fowl odor while investigating environment.